Cosmic reionization: Who is to blame? Title: A Hard Ionizing Spectrum in z = 3 – 4 Lyα Emitters with Intense [O III] Emission: Analogs of Galaxies in the Reionization Era? One of the interesting challenges in astronomy is pushing the boundaries of how far back into cosmic history we can see as we try to decipher how galaxies first formed and evolved. For example, astronomers are constantly on the hunt for the next clue in understanding how the universe became reionized – that is, how the neutral hydrogen that existed throughout the universe as it expanded and cooled was ionized as the first cosmic light sources turned on and started radiating energy. There is one significant signpost that can be used to identify some of the highest redshift (or most distant) galaxies: the n=2 to n=1 electronic transition of hydrogen, which produces energy in the form of Lyman-alpha photons. In the earliest galaxies, this strong ultraviolet radiation is emitted at a wavelength of 1216 Angstroms (or 121.6 nanometers.) This wavelength gets redshifted as the photons travel through the expanding universe until we observe them in the visible or near-infrared spectrum. Observing Lyman-alpha emitting galaxies, or LAEs, is one way to study the first galaxies and to determine if the intense star-formation that was likely going on in them was enough to cause the reionization of the universe. To answer the question of whether of not star formation in the first galaxies could have been solely responsible for reionization, astronomers have to determine if these galaxies emitted enough energetic photons. One way to do this is look for other emission lines that could only have been formed in a high-energy galactic environment. Specifically, emission lines such generated by electronic transitions within oxygen molecules such as doubly-ionized oxygen (denoted as [O III]), which is emitted in the visible spectrum at 5007 Angstroms, redshift far into the infrared spectrum for the earliest galaxies. Doubly-ionized oxygen is an oxygen atom that has had two electrons knocked out of the atom. Removing not only one but two electrons from an oxygen atom requires significantly more energy than, say, ionizing a hydrogen atom. When [O III] is detected from a galaxy, it is an indication that fairly high energy processes are underway. There is just one small problem: measuring [O III] emission from the highest redshift galaxies (think redshifts of 6 < z < 10!) is beyond today’s technological limits. Astronomers can get around this problem, however, by instead studying lower redshift galaxies that are analogs to those earliest galaxies, but in which the oxygen emission lines are more accessible with current detectors. In today’s paper, the authors looks at specific emission lines characteristics of z ~ 3 LAEs in an attempt to understand how their high-redshift counterparts may have contributed to the reionization of the universe. Figure 1 A plot of the ratio of [O III] to [O II] emission versus the R23 metallicity indicator. The various red points are Lyman-alpha emitting galaxies, while the blue shapes show the counterpart galaxies that do not emit Lyman alpha. The gray cloud shows where galaxies at z = 0 lie on this diagram. The Lyman-alpha emitters at z ~ 3 show higher [O III] emission than the other galaxies, indicating that the LAEs could have more energetic radiation fields. The main questions the authors of today’s paper wanted to answer was whether or not LAEs show increased [O III] emission, and thereby have harder (i.e., higher energy) ionizing spectra, then their galactic counterparts that show no Lyman-alpha emission. To do this, they collected a sample of 15 sources with oxygen emission using the Multi Object Spectrograph For InfraRed Exploration (MOSFIRE) on one of the 10-meter Keck telescopes on Mauna Kea in Hawaii. These sources were combined with previously studied samples of both LAEs and non-LAEs. 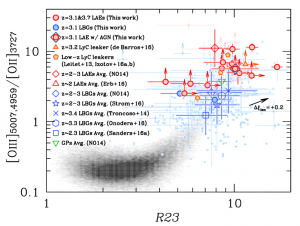 The results are shown in Figure 1, with the ratio of [O III] to [O II] on the y-axis and R23, which is a measure of galaxy metallicity, on the x-axis. As described above, dividing [O III] by [O II], which is the amount of singly-ionized oxygen, provides a measurement of how hard the ionizing radiation is from a galaxy. The major takeaway from this plot is the the LAEs, plotted with various red shapes depending on which sample they came from, have increased [O III] emission when compared with the galaxies that are do not emit Lyman alpha, which are plotted in blue. These results seem to indicate that in these low-redshift analog galaxies, LAEs radiate with higher energy than those that are not LAEs. Extrapolating this result to higher redshifts supports the idea that the earliest galaxies may indeed have emitted enough ionizing photons to be largely responsible for cosmic reionization. The authors are cautiously optimistic about this result. They note, however, that more detailed analysis and future observations could perhaps shed light onto other reasons why [O III] emission is enhanced in Lyman-alpha emitting galaxies. Ah, thank you for pointing that out!